I’ve shared a number of potato recipes but I tried this on thanksgiving, and i’m sold. The simplicity makes it all the more amazing, and this is going to be a regular at my table! The butter may seem excessive, but it’s necessary. Cut the potatoes into 1 inch cubes and toss them in the oil, salt and pepper. Pour them into a large oven proof dish. Cut the butter into small cubes and spread them around the potatoes. Sprinkle over some fresh herbs(I used basil but you can use parsley, dill or any other herb you have). 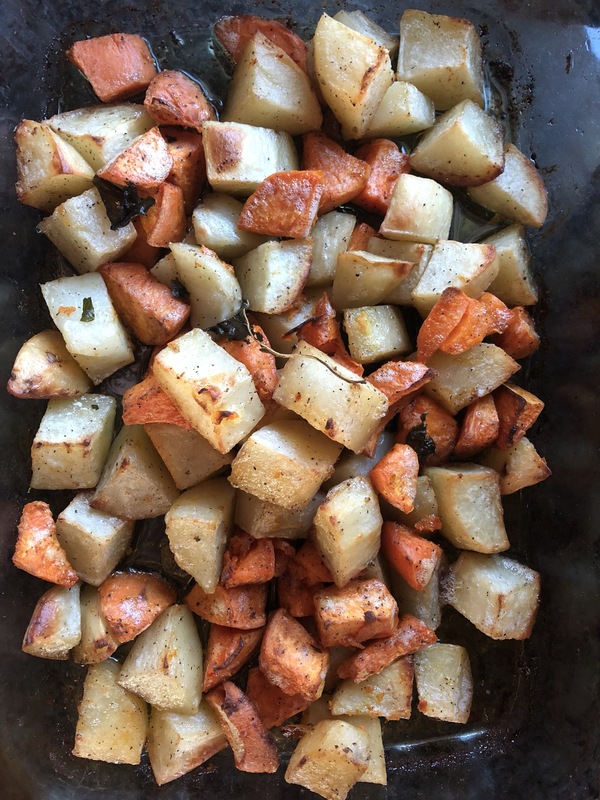 Bake for about 30 minutes, flipping the potatoes after 15, then lower the oven temp to 350F and bake them for another 20 minutes. If you want to add some extra color to the potatoes broil them for about 3-5 minutes. Serve as a side with some extra fresh herbs on top. *For some extra flavour add whole garlic cloves in with the potatoes. Once they’re baked you can mash them into some butter and make a delicious garlic butter, or use them to make garlic bread. These also go great as a breakfast side!